Hello again. I am returned with Codebreakers #2. I’m receiving so much information now that’s it too much to write it all so I’m speaking it in to a recording and my dear friend is transcribing it for me. Therefore you will get the advantage of hearing it, as well as reading it. And, the more senses we use to take in the information the more we can understand that information. Now, picking up where I left off with Codebreakers #1, I wish to say that as we move into our full awareness, it is important that we go back through the stages of our lives because there are components of our self that became lost in the rush, the hustle, the work and the fear of our third-dimensional life. Now these phases are Maiden/Warrior, which is from the beginnings of our twenties until we become parents and/or more responsible adults. Then become Mothers and Fathers. After that, we go into the third stage, which are the Mentor for females and the Sage for males. These three phases of our lives, and there are many phases within each small phase, but trust me, if you are in your twenties and you think you’ve experienced the Mentor phase, no it is completely different when you come to the age of the sixties and on. I will talk a bit about these three phases. In the first phase, which is the Maiden/Warrior phase, as when I first wrote this long ago the Maiden was always the female and the Warrior was always the male. But that’s not necessarily true now because there are many female warriors and men have the ability to have feminine talents, which was once judged as a feminine task. You can see how important this is because the polarities are beginning to close. When I was raised in the 1950’s girls could only wear skirts, and we would have Bermuda day about twice a year so we could wear pants. We had to wear girdles and nylon stockings no matter how young we were. Boys could not wear colors because it was not masculine. They could wear grey and brown and blue. The roles of boys and girls were very defined and there was a gap between. Therefore what is happening now is that that gap is diminishing. That third-dimensional either/or choice is moving into you can have both. We can look at those that are within that phase now in their early twenties. They are very different than the adults, and they are leaders in their own way. Therefore, those of us who have gone beyond that phase can go back and find that leader that we always were, and likely expressed in our own way quietly. Actually I was there in the 1970’s and it was great fun. I was so honored to be able to be alive during that time of being Codebreakers. We need to go back and regain that wonderful sense of freedom that we had at that time. But, then what happened is that the 1980’s came in and then everybody had to get jobs and support their children, the indoctrination began. Brainwashing was accelerated. So within that time of the 1980’s there was a great deal of brainwashing. Therefore, we need to go back in and break those old codes and find out what we learned during the 1980’s. Now, when you look at the 1990’s and beyond into the early 2000’s and 9/11, that was a terrifying time. That was a time that was destined to have World War III. But because so many of us who came in early, came in and took bodies, we took fragments of our wonderful multi-dimensional self and went into that time frame just post war. We broke the indoctrination and raised our children to break that indoctrination. Thus we were able to not have that World War III that was on the books to be started with 9/11. We all need to pat ourselves on the back because we stepped out of that possible reality and said, “Oh no, I will not participate in the reality of a world war. I will not do that! !” We stepped out of that reality and took our children and our friends with us. That was the first time that we began to realize that we could create another reality. If this particular collective reality is not to my choosing, I realize now that this is a multi-dimensional world and there are many realities that I can choose. “I refuse to participate in a reality based on fear, war and negativity." “I choose now to live in a reality based on Unconditional Love." We do have that choice, and if we can remember that, we make that choice. By choosing to create that reality, we have to BE our reality, and then we move into the Mother and Father stage. We are the Mothers and the Fathers no-matter what our chronological age is. We are the Mothers and the Fathers of this New Age. Therefore we lovingly take care of and assist those who have not, yet, remembered who they truly are. In order to fully recognize the manner in which we can assist these people we need to move into the next phase. The next phase is Mentors and Sages. Within this Mentor/Sage phase we willingly and openly become the leaders. Once we have progressed from the stage in which we are young and we began to recognize our self, we move into the second phase of Mothers and Fathers, which whether or not we actually gave birth to children, for we were all giving birth to this new planet. Then, we move into the Mentor, Sage phase to take full responsibility for everything that we have learned. Hopefully, we volunteer to be representatives for Gaia. We are here not to just recognize our own power and to orchestrate our own Ascension. We are here to align ourselves with the wonderful power of Gaia and with the wonderful power of Her core where the Lemurians, the Arcturians, beloved Sanat Kumara, beloved Kuthumi and all of the wonderful Ascended beings are ALL ready, willing and guiding us within every moment of the Now. 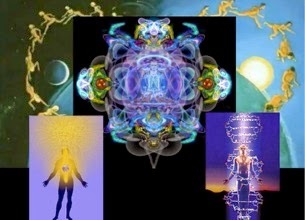 The Arcturians are there, the Pleiadians are there, the Sirians are there, and the Andromedans are there. Hence, we are not alone. We just have to expand our perception into the fifth-dimension and we will believe, because we will perceive. If we can believe it, we can perceive it and when we can perceive it, we can believe it. We will continue with part #3 of the Frequency Re-calibration Centers.